Notion that is common to all love relationships, whether it comes to marriage or not, is the expectation that the relationship lasts forever in its best form. However, since a partnership is not a fixed entity, but a dynamic interconnection that reflects the nature and development of both partners, it is the subject of transformation too. Each inner or outer change of one partner will somehow be reflected in the relationship. If the motivation for a partnership and the needs of two people concur or are compatible, as a rule, the relationship can more easily withstand the challenges and endure. One clear and not extreme astrological example gives the relationship of the Hollywood pair Brad Pitt and Jennifer Aniston that ended in divorce and held tabloid coverage for a some time in 2005. Even though I miss credible information about the nature of their relationship, the comparison of their horoscopes can give some clues about it. Astrology can detect how individual needs form the personality and assume how motivations lead individual behavior and decisions. Birth data from Astrodatabank: Jennifer Aniston - 11 February 1969 at 10:22 PM, Los Angeles, California, Rodden Rating AA; Brad Pitt - 18 December 1963 at 06:31 AM, Shawnee, Oklahoma, Rodden Rating A. Mutual attraction on mental and physical level is present here and astrologically detectable. Attraction is a requirement for two people to come close at all and to get to know each other. But deeper, psychodynamic needs play a major role when it comes to it, how relationships is going to withstand the test of challenges. And that is what I want to deal with here. 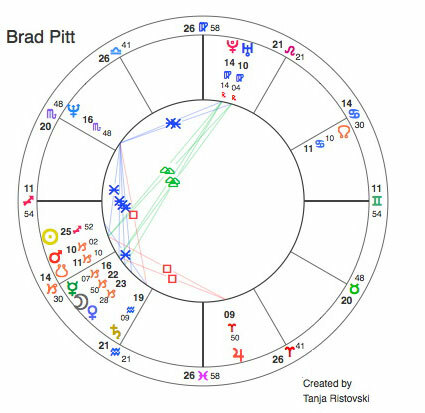 In the natal chart of Brad Pitt, that besides the Sagittarius Sun, there are Mars, Mercury, Moon and Venus all in Capricorn. This suggests a sober, down-to-earth way of dealing with emotions and passions. Moon in Capricorn needs some kind of authority in partnership. Than can be related to issues of career or financial areas, or it can be reflected in daily, organizational circumstances. At least one of these areas needs to be felt as personally advantageous in the relationship and should serve personal goals or the ambition. Emphasized Capricorn indicates that responsibility plays a role in the partnership but it can be related to areas other than fidelity. We see peregrine Sagittarius Sun, which highlights the energy to explore life through experience. In other words, lust for adventure, be it in mind or in reality, is strong and that can lead to inner conflict so long, until he finds some ways to bring together the responsibility and the adventure. Idealism is inherent to this position too - concepts and ideas are very important. Psychodynamically, these personal opinions serve the goal of affirming the personality. Jupiter in Aries confirms: the strong ego demands affirmation and fulfillment independently from partnerships, through seeking opportunities to justify own importance. In other words : feeling very special and like a Number One, in relationship or elsewhere, is what satisfies and is supposed to crown all his efforts. The horoscope of Jennifer Aniston shows a different picture. With Venus in Aries and Moon in Sagittarius her emotional nature is spontaneous, extrovert and sociable. Mars in Scorpio suggests strong feelings, it is connected to Neptune, so she is able to veil her passion or to delay or sublimate its expression. She seems to be driven by feelings, which is in strong contrast to the matter-of-factly manner of her then partner. Her Sagittarius Moon is as idealistic as the Sagittarius Sun. But idealism and expectations, as well as strong personal opinions have a different psychodynamic role here. They serve to create or preserve emotional security and can mismatch the reality. The challenge for Sagittarius Moon is to develop the reference to reality as it is, so that the needs can be better fulfilled. This Moon position suggests that a friendly love is sought in relationships, where trust should leave room for personal freedoms. Those are wanted not only for one self, but are granted to the partner too. Therefore trust plays an important role and is readily bestowed upon the partner. Aquarius Sun is social, it seeks closeness to people and likes to be part of a group. The Jupiter is here in Libra: to have a relationship and to be appreciated by others is what brings the fulfillment and what should crown all personal efforts. 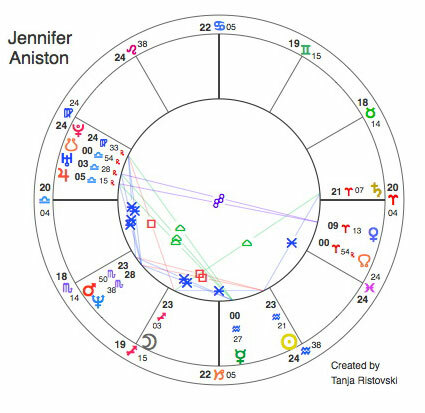 Certain personal characteristic can be compatible: the sober and practical manner of one partner (here the Earth element in the horoscope of Pitt) can balance the emotional and spontaneous energy of the other (Fire element in the chart of Aniston). Or the other way round: the enthusiasm of Fire can inspire the levelheaded Earth for new things. But more important than personal characteristics are the expectations that two partners put on themselves and on the relationship. Holistic astrological analysis shows, that expectations do not follow the same direction in this relationship. Aniston needs a relationship with much personal space and trust, as well needs she to be very social in order to feel fulfilled. Pitt needs a relationship that takes direction of the goals set, and that allows new experiences through which he can affirm himself. The marriage between the two ended in 2005. Neverthless we cannot make conclusions about the longevity of a partnership by comparing two horoscopes. There is no reliable astrological method that can predict that. It is decisions that people make, be it on emotional or rational, conscious or not so conscious, that bring a relationship to an end. But the horoscope analyses of two partners can give the insight into the inner order of a relationship.